The simple clean styling of Aspect is both classic and contemporary and looks at home in any setting where style and quality are important. The profile is just 4mm, while the concealed screws leave an elegant frontplate making it more attractive still. In addition to impressive looks, Aspect comes with unrivalled safety. Utilising MK's 3 pin operated safety shutter that prevents misuse and unsafe access to live circuitry, Aspect offers the user not only great aesthetics but complete peace of mind. 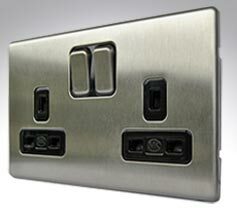 Aspect screwless switches & sockets in stainless steel with black inserts. 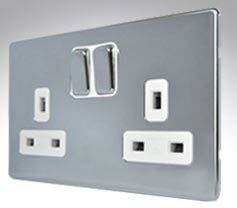 Aspect screwless switches & sockets in stainless steel with white inserts. 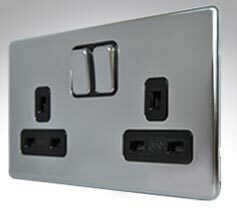 Aspect screwless switches & sockets in polished chrome with black inserts. 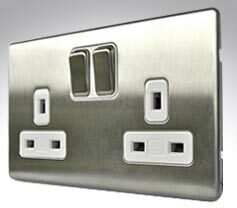 Aspect screwless switches & sockets in polished chrome with white inserts.